With all due respect, get that weak stuff out of here. COLUMBUS, OH — When Teaira McCowan grabbed her 23rd rebound of Mississippi State’s semifinal win over Louisville on Friday night, she just kept coming down with it—all the way to the floor. That’s a long way down for McCowan, who stands a muscular 6'7", but she wasn’t going to let this rebound get away. That board helped send her Bulldogs back to a championship game they’ve been focused on winning ever since they came up one game short last season. McCowan had a big smile on her face when she hit the ground, and the ball grasped securely in her two large hands. “I didn’t want them to get it and get a bucket,” McCowan said Friday night, sitting in front of her locker with an eye on the second semifinal. “So I just held onto it. And even though they called a travel, I was still glad that I didn’t give them the ball so they can get a easy bucket.” One way or another, there are no easy buckets against Teaira McCowan. If you want just one reason why Mississippi State is heading back to the women’s final, you’d do well to start with the biggest. Height came to McCowan early in her life, leading her to find ways to hide in the small Texas town where she grew up. It was there that she honed the work ethic that helped turn her big body into the sculpted WNBA-ready masterpiece it is. (McCowan intends to return to school next year to complete her degree.) In building her physique and her game, McCowan has displayed a motor that is unlike anything her coach, Vic Schaefer, has seen in a big. Schaefer noted he’s got an entire team that lives for the moment, and he has the roster to match. The heroic Morgan William, author of last season’s historic game-winner against UConn, is supplemented by all-American Victoria Vivians; Blair Schaefer, the prototype coach’s daughter, flies around the floor taking charges and sinking threes. Schaefer doesn’t hesitate to mix and match, either, and subbed freshman Chloe Bibby for Vivians several times on Friday night to great effect, as Bibby contributed solid minutes and Vivians re-focused on her shot selection. William splits time at point guard with defensive wizard Jazzmun Holmes. But one Mississippi State player did not come out Friday night, which saved Schaefer from winding up on the wrong end of a McCowan scowl and helped save a win for the Bulldogs. In ways great and small, the Bulldogs’ indispensable big has helped Mississippi State go from being 60-point victims against Connecticut back in 2016 to snapping the Huskies’ historic streak last year to securing a game on Sunday against Notre Dame to reach the apex of the sport. To hear them tell it, both Schaefer and McCowan realized that their lopsided loss against Connecticut back in 2016 could have been the start of something big. Mississippi State was ridiculed after that historic rout, but as the team walked out of an arena in Bridgeport, CT on that overcast afternoon, their coach was thinking about what McCowan showed in that defeat. The Bulldogs shot just 18-for-62 that day, while Breanna Stewart, Moriah Jefferson, and the rest of the Huskies turned in as close to a perfect performance as any sport has ever seen. Vivians struggled. William struggled. Only McCowan, a freshman, seemed ready for the moment. Coming off the bench, McCowan shot 5-for-6 against a Huskies team that may be the greatest in the history of the sport, finishing with 10 points in just 18 minutes. When it was over, McCowan didn’t look like others who Connecticut beat that season. She lost, but she wasn’t defeated. On Friday night, the entire country saw what they both saw that afternoon in Connecticut. 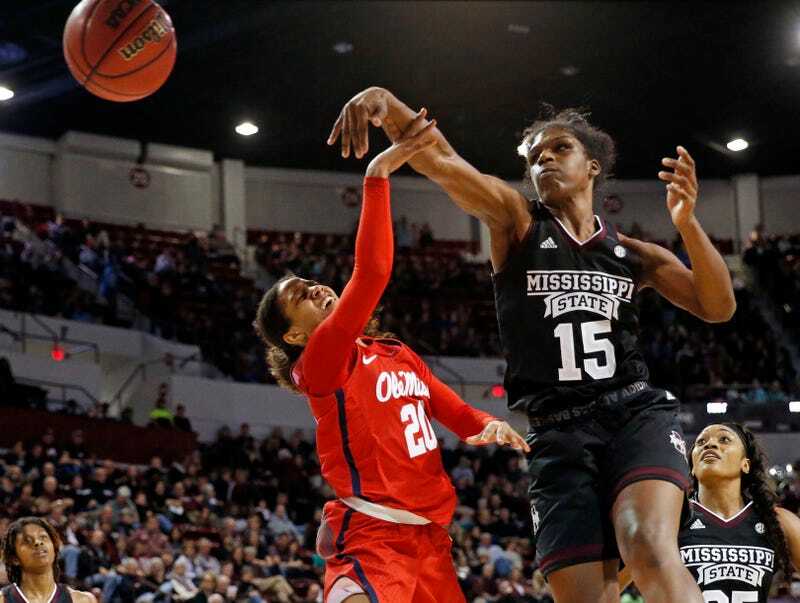 In a year when McCowan played A’ja Wilson of South Carolina to a draw to give Mississippi State their first win over the defending champs back in February and saw her score 35 and grabbed 19 rebounds against an Elite Eight Oregon team, McCowan delivered a singular performance when her team needed it most. The simple, inexorable force of McCowan’s physicality frustrated Louisville; it swung the game, even on a night when McCowan didn’t dominate the way she can. It may sound like an odd thing to say about a player who set the NCAA Tournament single-game record for rebounds with 25—and set the record for most rebounds in an NCAA Tournament with 76 less than halfway through the national semifinal—but Louisville did a great job trying to limit her. They denied entry passes and McCowan missed her first four shots. She didn’t score from the field until 2:32 remained in the first half. But the effort of merely containing McCowan clearly wore Louisville down, as it has so many Mississippi State opponents this year. McCowan is a staggering match-up advantage for Vic Schaefer. That he can play her for 36, 40, in this case 45 minutes—on the podium after the game, she gently reminded her coach that she played 45 in this one, every minute of regulation and overtime, when he credited her for merely a regulation 40—is what makes the Bulldogs unstoppable more than any other single aspect of this remarkable team. Down 53-50 late in the second half, Schaefer called McCowan’s number, and William fed her in the post. She’s helpful when used that way, but her knack for turning missed shots into points is the essential scheme that brings McCowan’s offense to life. That’s how it went one possession later—another rebound, another putback that gave Mississippi State the lead. The game effort of Louisville’s Sam Fuehring, working as head of her team’s Stop McCowan Committee, ultimately got to her; she drew the fourth foul in foiling another McCowan putback. When she slammed the floor in frustration, she earned a technical, ending her night and adding her to the list of players who have had to confront the painful realities of facing the closest thing the women’s game has to an unstoppable force. McCowan saved her team’s season by corralling a Vivians miss with 35.8 seconds left in regulation, which gave the Bulldogs the final possession they needed to force overtime. She set the screen that freed Ro Johnson for the game-tying three. By then it was over, really. Louisville was overrun and out of gas, their efforts to slow McCowan down simply ground into dust by the sheer insistent fact of her. Yes, McCowan traveled and turned it over on that 23rd rebound, but then she altered another Cardinals shot and picked the rebound off the rim for her 24th. At the other end, the outcome all but decided, she burst through the tape: another offensive board for rebound number 25, followed by a putback on which she drew a foul. This earned a standing ovation from a crowd of 19,564, which got louder still when McCowan swatted a Louisville shot into the stands in the closing seconds, finding reserves she credited to simply telling herself that she isn’t allowed to be tired. Teaira McCowan majors in educational psychology, and she understands moments, and arcs. She knew that day in Bridgeport, back in 2016, that she could turn herself from someone who watched her teammates falter into a player who destroys opponents’ wills. In person, McCowan is sweet, gentle, and irrepressible, but she doesn’t hide in her room anymore. She knows she can do more for kids like her, who are awkward or different or merely shy, by showing the world what it means to go from introversion and doubt to pride in her own success and uniqueness.